Your 3-0 Tigers kickoff against the 2-1 Holland College Hurricanes today at 1:00 pm. Don't miss it live on the Bell TV1 Webcast: http://player.communitylive.ca/Player/Player/15. Go Tigers! Dal200 Homecoming 2018 at Wickwire Field! 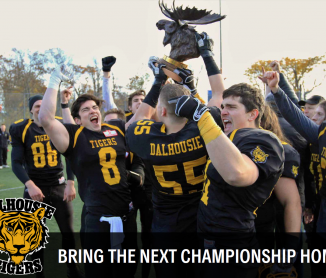 Alumni, students, faculty, staff and members of the Halifax community are invited to cheer on the Dalhousie Tigers football team during Homecoming 2018 and to celebrate Dal's 200th anniversary! The 2-0 Tigers kickoff against the 2-0 Holland College Hurricanes at 1:30 pm. Join us for a homecoming after-party in The Grawood right after the game to celebrate … Continue reading Dal200 Homecoming 2018 at Wickwire Field! Catch the Tigers taking on the UNB Fredericton Redbombers in Game 1 of the AFL season at http://player.communitylive.ca/Player/GetEvent/4489 at 7:00 pm AST. Go Tigers!